We are a small scale flower farm, located in the heart of Vermont. We giggle that we are a "femto farm", which is pretty tiny (a factor of 10 to the negative 15, to be exact...). Being small is good because our energy can be focused on quality. Every flower is lovingly nurtured. It is the only way to grow. It is important to be uncompromising when it comes to nurturing living things. This farm is thriving with the lives of many birds, bees, toads, beetles, insects, frogs, spiders, bugs, and mammals. We are all intertwined. Growing using natural inputs gives each life the potential to thrive fully. In such, we foster the anima mundi of place... our place on this green earth. We sell to floral designers, many of whom are tucked away in private ateliers in the hills and mountains of magical Vermont. We sell to cute, funky flower shops in busy little towns and big busy shops in big bustling towns. We sell to mom and pop shops and food stores looking for something different. We sell to brides who want to do their own floral expression on their most important day. We deliver to special parties that want to make a special statement. No matter who it is, our clients receive top notch customer service. Each flower order is fussed over to perfection. Give us a color scheme and we can run with helpful ideas based on what is growing and ready. We are partners with our clients in delivering the very best product possible. Remaining current is of paramount importance to Maple Flower Farm. We spend our winter revitalizing our floral offerings for the next season and travelling to see whatever might be new and enticing. It is all heady and wonderful stuff. Hi, I'm Liz Krieg. 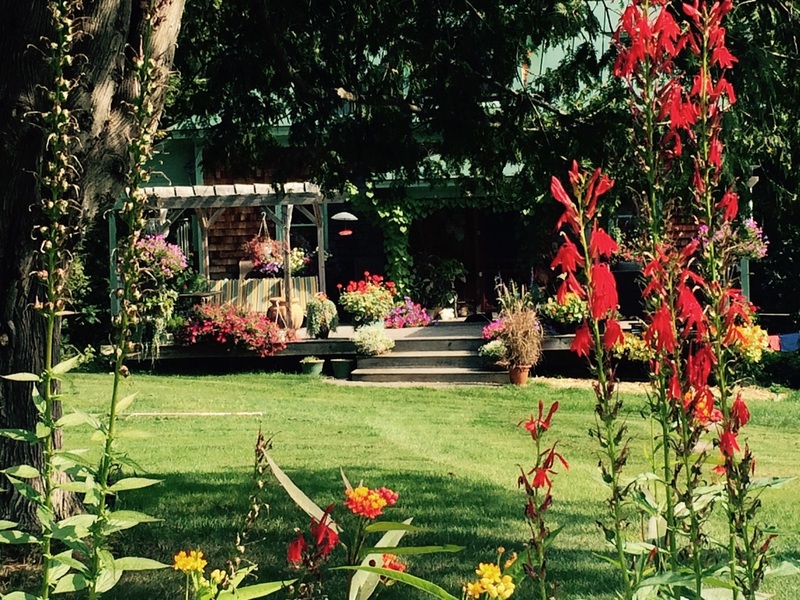 I began growing fresh cut flowers in 1989, here in Vermont. I enthusiastically accepted an invitation to be the founding president of the Vermont Cut Flower Council. I was the point girl for every farmer in the state who wanted to get rich quick. This flurry lasted about 2-4 years. Local fresh cuts were a hard sell back then. None of the florists were ready to trust "local grown". Out of the numerous wannabe flower farmers, only two of the original members are still in business today. The Vermont Cut Flower Council folded, most growers eventually gave up growing flowers and I was one of them. 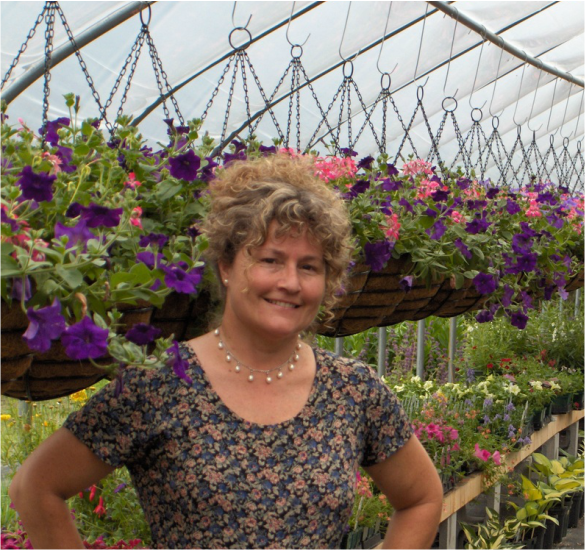 I was a young mother, a degreed horticulturist, and out of need I put my knowledge into building a successful landscape enterprise (complete with greenhouses), which I owned and operated for 20 years. I have now sold my business and have been able to focus on my burgeoning home gardens. Flowers have always been key to my happiness. It was C. S. Lewis who said, "You are never too old to set another goal or to dream a new dream". In my case it is "dream an old dream". I was casting about for the next reinvention of "me". I realized that my fondest memories were, and are, the pink, dew-laden mornings picking armloads of flowers. Yeah, it sounds romantic, but it is proven that I am not faint of heart when it comes to hard work and I've earned the right to put a little fairy dust on it if I wish. I am growing fresh cut flowers in abundance! My intentions are being fulfilled. I am working this good earth, with harmless inputs and sustainable methods. The flowers shine brilliantly. The birds and bees are happy. What more is there?